Having worked together with Michel Auder on Am Königsweg with Falk Richter in 2017, we now collaborated again for his new short film TRUMPED. i produced the sound and music for the piece, which is now on display during his new show at Martos Gallery, NY. A nice review of the work can be found on hyperallergic.com. Martos Gallery is pleased to present Michel Auder’s second solo show with the gallery, And virtually everything said has been said incorrectly, and it’s been said wrong, or it’s been covered wrong by the press, on view June 15 – August 3, 2018, which features his new film TRUMPED (2018), a mural of new photographs. A large mounted photo, standing seven feet tall, greets you before you enter the main gallery. The mural spans the longest wall in the gallery and is composed of dozens of photos arranged and pinned by the artist. It reads like a text; his own language of violence, emotions, politics, transference, and subjectivity. Freestanding walls made by artist Servane Mary divide the gallery and create an intimate space for guests to read it. 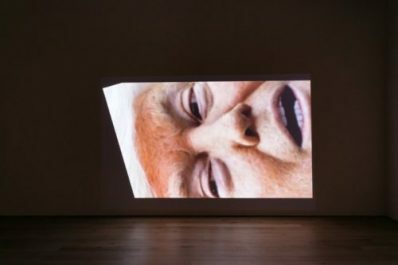 TRUMPED (2018) is projected on the opposing wall in the gallery. Similar to the immediacy of his photo-making, the footage is captured entirely from Auder’s cell phone and goes through moments of stop-motion, surveillance, and flashbacks. The film’s original score by Matthias Grübel is heard throughout the gallery. As an author, Auder’s visual narratives carry a diaristic tone – rid of didacticism. Though these “texts” in the gallery, both pinned and projected, are not composed of traditional linguistic signs like letters and phrases, as a semiotic text it is Auder’s Umwelt; a lexicon that is based on both limited knowledge and unimagined possibilities. Since the early 1960s, Michel Auder has been capturing everything around him. Never without some form of camera in hand, his collection of images, both still and moving, is prolific. His practice has been called “second nature,” but would more accurately be described as first nature. Through decades of ever-changing technology – film to digital, super 8 to HD – the lens has remained a constant extension of Auder’s body and an ongoing archive. Rather than complain about new technology and social media, and as a result, the saturation of images many of us experience, Auder embraces it. He embraces saturation.